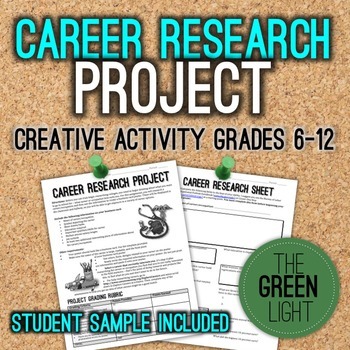 Get your students excited about researching careers with this creative project. 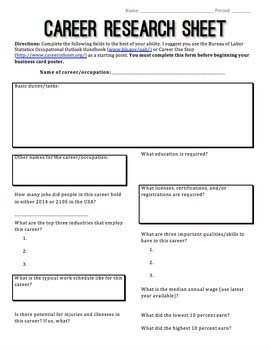 Students select a career or occupation and conduct research, using the research guide. 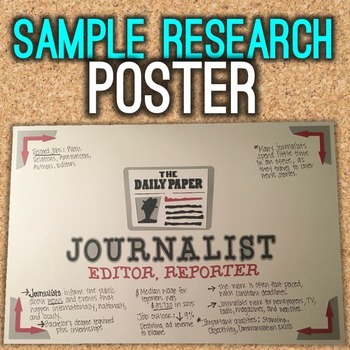 Then, they use the information to create a poster in the style of a business card, which can be displayed in the classroom or hallway. I used 12x18 pieces of white poster board, and showed students samples of basic business cards. Students then create their own business card posters, illustrating them with their symbol of their career and other required information. This is a great way for students to begin the college and career research process and to learn about a variety of different fields from the display. I used this project with my high school students, but it would easily work for younger grades, including middle school. It makes a great AVID or advisory activity. 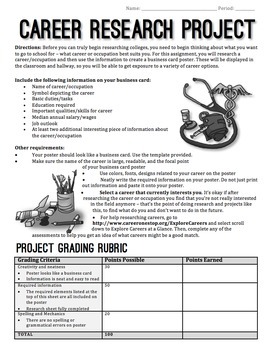 This bundle includes the assignment sheet, rubric, research guide, and picture of sample student work. Both Word and PDF files are included.